Traveling to Cuba - two Boston photographers take on the trip! Today, my first guest writers for the travel section are here and introducing you to a country on my bucket list: Cuba! Alyssa and Saili, both Boston-based photographers, traveled to Cuba this past year and have come back with some of the most gorgeous photography, along with the most delicious & colorful stories ever – I’m happy to have them share their experience on what to see, do, eat, and drink in Cuba, along with some travel tips and tricks on how to make the trip happen. Take it away ladies! Cuba stole our hearts months before we arrived. Images of vintage cars, colorful facades and expressive locals mesmerized, gratified and consumed us, so we acted on the desire. We booked a spontaneous, four-day trip from Boston to Havana to experience and photograph the country ourselves, proving to be a timely and opportune decision (new regulations announced two days before our departure will make it more difficult for Americans to visit in the near future). While we anticipated incredible pictures in Cuba, we knew very little about the people and the culture. American travel is still relatively new, so there’s not an overwhelming amount of information available online. With that, although both very well-traveled, we had initial concerns as two young females alone in a country in which communication isn’t readily available; however, all of our worries subsided at the onset of our trip. Cuba is vibrant and alive. Buildings are brightly painted, and the streets carry an unmistakably powerful and contagious energy. Cubans are incredibly inviting, warm and inquisitive; they’re just as interested in us as we are in them. We witnessed a distinctive sense of community and pride. Locals sit on their porches at all hours, conversing with neighbors and engaging tourists, eager to show off their surroundings. Despite hardships, Cuba seems to be developing and thriving while maintaining its cultural identity. After four full days, we left Cuba with a stronger cultural understanding, unforgettable connections and a burning desire to return. Plus, thousands of pictures exceeding our initial imaginations and capturing pure, genuine joy exhibited by Cubans. If you get the opportunity to travel (and we hope you do! ), here are some tips based on our experience. 1. Food & Drinks: We both share a strong passion for food, especially while traveling and exploring new cultures. In our experience, however, Cuban food can be quite confusing and, honestly, bland. Some of its simplicity is due to the embargo on imports and fluctuating food supply, and some reflects the country’s rather conservative attitude when it comes to food creativity. Staple Cuban dishes include ropa vieja – shredded beef in a stew, with green peppers, tomatoes, onions and garlic – and lechon – marinated suckling pig – which is deemed a bit more of a delicacy. All traditional meals in Cuba are served with rice and beans. In the past few years, several private restaurant owners have begun innovating and bringing new flavors to the table, yet these typically fall in the form of other countries’ cuisines. We saw (and consumed) a lot of Italian, Greek and Mexican fare. We heard Japanese food is making a big entrance in Cuba, but we didn’t personally experience any dishes. o La Farmacia: Located on a charming street in Old Havana, La Farmacia became our favorite breakfast spot. For $6 CUC, we ordered a traditional breakfast with fresh fruit, coffee, a smoothie, eggs your way and toast with ham. We also had great conversations with one of the owners, Ernesto, and a local gentleman who lives adjacent to the restaurant and observes from his window all hours of the day. o La Fabrica:Fabrica is an interesting mix of bar,club,art gallery, and restaurant.Every room you enter has a new theme and purpose, and the vibe is innovative and trendy. In turn, the slightly upscale restaurant within boasted creative, flavorful dishes, celebrating cuisines around the world. This was probably the best meal we had in Cuba. o El Cocinero: Next to La Fabrica, this restaurant has a phenomenal rooftop and chic, modern atmosphere. We shared a couple small plates (including a fantastic cheese plate), two entrees and a few glasses of wine! o Lamparilla Tapas & Cervezas: Lamparilla is a modern, open restaurant with a 70s diner feel in Old Havana. Like the others, it has quite the eclectic menu, featuring mostly international dishes. Our favorite items were the octopus, charred and marinated in delicious spices, and to close the meal, leche frita. This is a Cuban dessert of fried sweet and condensed milk; seriously as good as it sounds. Another way to get the local food experience is through paladares, providing home cooking in residences. These were legalized by the state in 1990 and have been increasing significantly in popularity. Here you’ll not only get authentic, home-cooked food, but also dedicated service and atmospheric surroundings. As for drinks…rum is the local staple, so you must try a Mojito or Cuba Libre while traveling. If done right, the mojitos are incredibly fresh, with sugar cane, and muddled lime and mint leaves. If it’s way too early or you’re feeling dehydrated, we recommend getting a virgin Mojito; they’re incredibly refreshing! The typical Cuban coffee is pre-sweetened espresso. Many restaurants offer a Spanish-inspired beverage called bombon, which is three-layers: sweet, condensed milk, espresso and foam. A sweet treat to start your day! Last, but certainly not least, dessert. The best way to combat the summer heat is with…ice cream! There are several shops, and you’ll notice even the locals indulging. Flavors range from local fruit (e.g., ginger and mango, mamey) to chocolate delicacies (e.g., cookies and cream, chocolate chip). 2. Money: Do not expect to use your credit or debit cards in Cuba: Cash is king, so plan ahead! There are two currencies in Cuba: convertible pesos (CUC$) and Cuban pesos (MN). Almost everything you’ll be buying on your trip for will require CUC$. MN are typically requested at fruit and vegetable markets, and on local buses. Before setting out to Cuba, exchange your U.S. dollars for either Euros or Canadian Dollars. U.S. dollars are subject to a 10% tax/commission, which will likely incur ‘sticker shock’ if you’re not aware of this going into your trip. The exchange line at the airport in Havana will be extremely long if you’re coming in on a crowded flight, so be prepared. Note that all exchange rates in CADECA (change bureaus) are identical, so no need to shop around. Additionally, many hotels have CADECAS on-property. 3. Wi-Fi: Although available, Wi-Fi is expensive and not always reliable in Cuba. Additionally, it is restricted and controlled by the government, so browse with caution. To get access, you will have to purchase a card from an ETECSA center, hotel or casa particulares with Wi-Fi capabilities, and then log in. It’s relatively easy to identify public Wi-Fi hotspots, as a large group of people will be gathered in close proximity on their phones! Our best tip is to download or screen shot everything you can foresee needing in advance of your trip (e.g., directions, reservations, addresses, etc.). Download a map of Havana on maps.me, which can be used offline and is extremely helpful. Also, leverage FaceTime on Wi-Fi to keep in touch; despite inconsistent connections, we were able to see our families daily! 4. What to Pack: You won’t see convenience stores in Cuba, so be sure to pack all commodities. Sunscreen is crucial in the summer heat, as is bug spray post-rain when the mosquitos are out. Not every public restroom has toilet paper and soap, so we’d recommend baby wipes and hand sanitizer. Additionally, a first-aid kit with basic medications is advised (don’t forget Advil in case you order one too many mojitos!). If you visit in the summer, the heat is intense! Pack light clothing. No need to abide by any strict dress code, as locals typically wear minimal attire. Comfortable shoes are necessary if you’re planning to walk around like we did. You may need multiple outfits per day if you’re planning to sight see during the day and go out at night! 5. How to Get Around: We recommend walking everywhere you can! There’s nothing better than experiencing “street life” in Old Havana, venturing up and down the brightly painted, narrow allies, and engaging with locals. If walking isn’t feasible, there are several other options. For all, make sure you understand the fare very clearly before you get in. 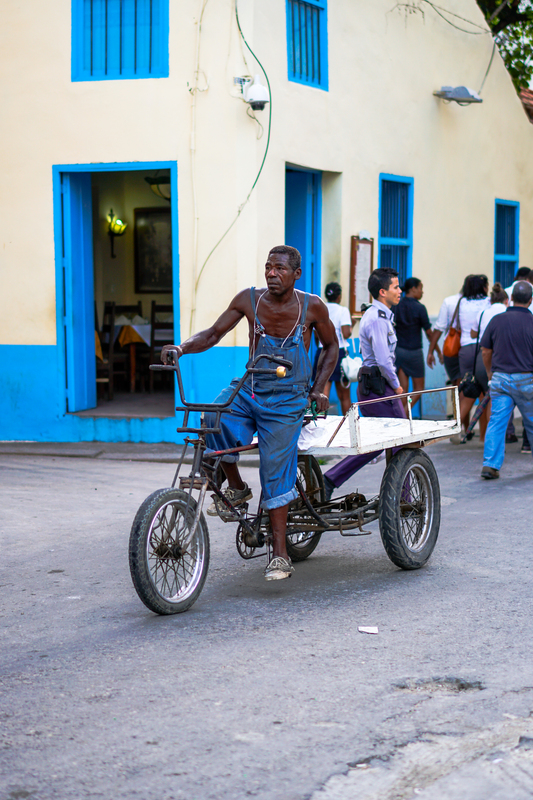 Bicitaxis (Bicycle Taxis): Cuba’s very own adult tricycles, with two (or a very tight three) seats behind the driver. You’ll see these cruising everywhere around Old Havana. If you hear someone whistling behind you, take note that they’re not necessarily checking you out; they may be trying to pass! Turistaxis (Tourist Taxis): These aren’t the glamourous, old-fashioned American cars. They’re the state-run, yellow taxis, typically in the form of European or Japanese vehicles. While most state taxis have a meter, drivers typically provide a flat fare at the onset. With meters, money goes to the state to be divided up; without the meters, money goes straight to the driver’s pocket. Taxis Particulares (Private Taxis): We highly recommend playing ‘tourist’ and riding around in a classic, American car (almendrone), especially along the Malecon. These tend to be more expensive than tourist taxis, but you can negotiate rates based on length of time and destination, and it’s certainly worth feeling like a movie star on a beautiful day! Keep in mind that not all private taxis are classic cars, however. Before your journey begins, be sure you have your firm destination in mind, and communicate accordingly. Many drivers may try to persuade you to switch your drop off point, as they sometimes receive ‘cuts’ for bringing in business to their friends’ establishments. Our very first tourist taxi provided us with the following advice to determine whether a driver is providing honest advice or more of the, well, selfish kind: If the driver gives you a recommendation on one restaurant, ask for two more suggestions. Whichever restaurant he/she is pushing the least, go there! We, still, admittedly fell ‘victim’ to this tactic on day two. Our driver noted that our desired restaurant was a bit isolated, and he knew of a better area that had several restaurants to choose among. It sounded appealing to be in a local “hot spot!” Our mistake for wavering, as he brought us very far out of the way to his friend’s restaurant. Alas, we paid double fare in a new taxi to take us to our initial destination. Taxis Colectivos (Shared Taxis): If you see a packed car in Cuba, especially with multiple people across the front seat, it’s likely a communal taxi. These drive along specific routes and charge fixed fares. They’re not conducive if you’re on a time-constraint or traveling with large bags. City Buses: We personally didn’t ride the local buses, but we can confirm that they tend to be extremely crowded. Many other tourists noted based on experience that they’re also very confusing and chaotic. If you’re down for an adventure, we’d say go for a ride! 6. Where to Stay: There are three main categories when it comes to places to stay in Cuba, and they all require advance planning: Hotels, AirBNBs or Casa Particulares. Hotels: We opted to stay at a well-known branded hotel. Be advised that many of the nicer hotels in Cuba are located several miles outside of Old Havana in the Miramar district, about a $15 CUC taxi ride. We were able to pay through credit card in advance, but everything on-property required cash. Please also note that five-star hotels in America are not the equivalent to five-star hotels in Cuba; we had a lovely experience, but many other tourists were disappointed with the service and outdatedness for the cost and brand reputation in America. We’d also note that both AirBNBs and Casa Particulares are the more cost-efficient and centrally located options. AirBNBs: If you choose to stay at an AirBNB, ensure you book far in advance, as these options tend to sell out quickly. Rooms can be paid for via credit card through the website, and they’re much cheaper than hotels. Be advised that several rooms within one home may be rented to guests at any given time. Casa Particulares: These are basically just AirBNBs; however, you book directly through the home owner. The major benefit, in addition to the cost and authentic experience, is the ability for your host to help with recommendations and bookings. We even heard about some that cooked breakfast for their guests! We appreciated the Wi-Fi made available at our hotel and daily cleaning services; however, we’d likely look into an AirBNB option on a following trip given the cost, authenticity and proximity to the city. 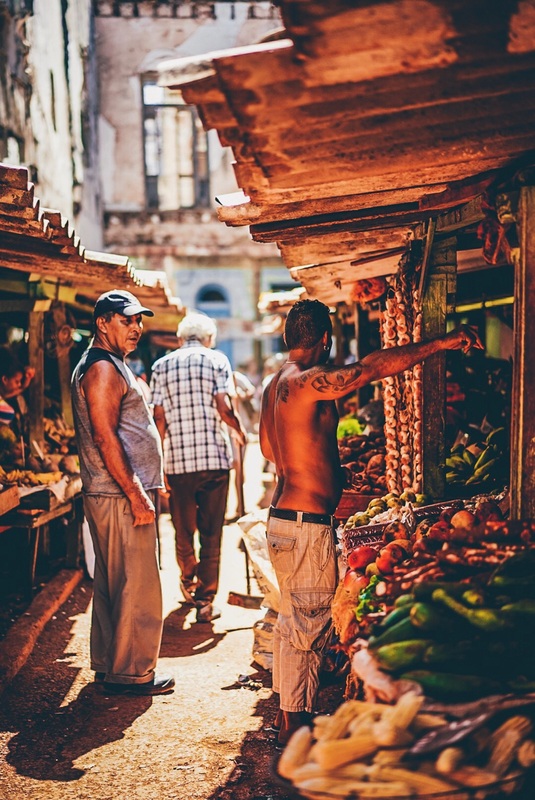 Fresh Markets: These are great places to capture local Cubans amid their day to day. Markets not only give you a sense of what Cubans eat, but also how they interact with one another. Also, if you’re in the mood for fresh fruit, this is the place! Balconies: Although there’s plenty going on at eye-level, don’t forget to look up! People love to hang out on their balconies, whether relaxing, people watching or communicating down below. Sometimes, you’ll also see four-legged friends keeping watch from the balcony level. Barber Shops: Most of the shops welcomed us, both from outside the door and inside the business. School Children: First thing in the morning and in the afternoon, you’ll notice children in the most adorable school uniforms! We loved capturing after the school day, when they were typically hangingwith their friends or eating ice cream! El Malecon: Want to enjoy the ocean and city simultaneously? This is your spot. The malecon is a walk next to the ocean. It extends for about 5 miles in the city. El malecon is vibrant and packed with locals as well as tourists. You can enjoy the beautiful vintage cars driving by as the ocean breeze refreshes you. This is probably the best place to catch a good sunset. Vinales: If time allows, we absolutely recommend traveling outside the city and getting a feel for the country life. We decided upon Vinales, a little over two hours outside of Havana, boasting scenic views and lush green everywhere. We booked a private tour in advance for a day trip and highly recommend it. If you have more time in your travels, many people opt to stay overnight in casa particulares or AirBNBs. 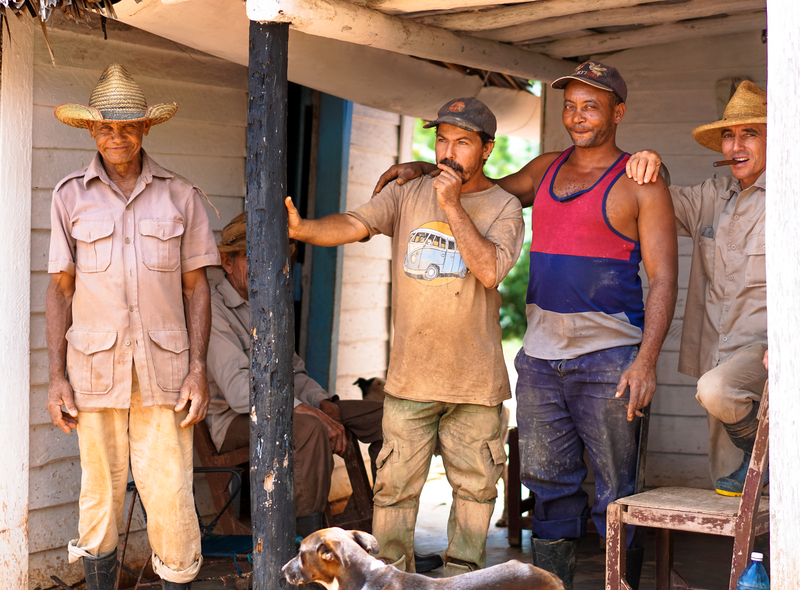 Our favorite experience in Vinales was visiting a local tobacco and coffee farm. The farmers invited us into their home, where we rolled cigars, drank fresh coffee and talked about local life. The cigars (our first!) were incredibly smooth, and we loved how they dipped the tip in honey, giving every ‘puff’ a sweet flavor. Our husbands enjoyed the cigars we traveled home with! Many other visitors opt to ride horses in Vinales, but we skipped this part and maximized our time with the farmers. That concludes our trip to Cuba! Overall, as two young, females traveling alone, we felt extremely safe and welcome. While it wasn’t our very favorite food country, we’d absolutely return to the vibrancy and joyous locals…and delicious mojitos! Have you been? We want to hear your thoughts! About Alyssa and Saili: Alyssa (Instagram: @thebeaconhiller) is a 29-year-old marketing and social media consultant, living in Boston. She has an insatiable appetite for food, travel, adventure and discovery. Saili (Instagram: @ddskline) is a 26-year-old nurse-turned-photographer, & mom to two-year-old Diego. She is a travel & adventure junkie loving to meet locals wherever she goes. Alyssa and Saili met on Instagram & have become one another’s favorite travel buddies – aside from their husbands!